Brilliant in color and flavor, this creamy dairy-free version is wonderful with a slice of whole grain bread for a light lunch or as the first course at a dinner party. This recipe is great for the winter months when fresh tomatoes are expensive or hard to find. 1. Bring the vegetable stock or water to a boil in a 3-quart or larger stockpot, adding in the onion, potato, celery, and carrot. Boil until vegetables are tender, about 10 minutes. 2. Turn down the heat to medium-low. Add in the can of diced tomatoes and tomato paste, stirring until combined, cover the pot and let simmer for 20 minutes. 3. Turn off the heat. 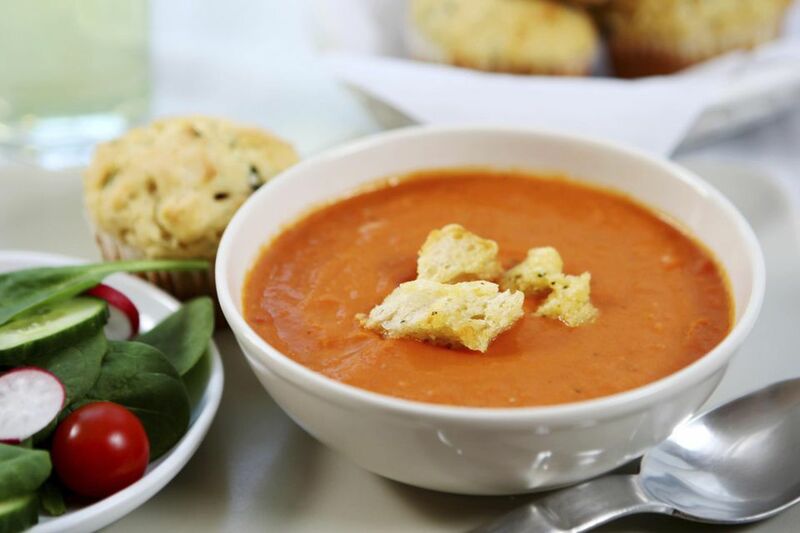 Carefully, one cup at a time, puree the mixture in a blender or food processor until the soup is consistent. 4. Add the liquid back into the pot and stir in the soy yogurt, salt and pepper. Heat until desired temperature and consistency. Serve hot, garnishing with a bit of soy yogurt or fresh herbs if desired.